The Glass in Society project aims to introduce teachers and school children to glass, glass technology, its uses and behaviour, as well as frequently to bring an understanding of composite technology into their education for the first time. The project allows students to earn a Crest Award, which is a national accreditation scheme designed to recognise achievement in science and technology. In the Isle of Wight a Glass in Society project was run between 2006 and 2011 and touched the lives of thousands of children who live on the island. The project introduced children to the modern uses of Glass Fibre by encouraging students to research and understand all the new composite materials and the benefits that they bring to marine design. The Phiz Lab at Shrubland Street Primary School in Leamington Spa which has created a shared resource for a partnership of 12 schools to allow whole class microscopy projects to support the ‘Working Scientifically’ aspect for the KS1 and KS2 Science curriculum. Students from the Aerospace department at Fareham college are re-molding the body of the 750 Formula race car out of fibreglass materials. Kingswinford School in Dudley became the first state school in Britain with their own observatory. 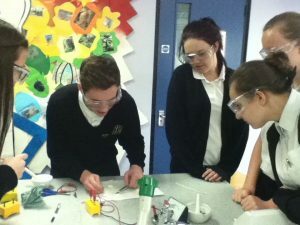 The Blue Coat CE School in Coventry investigated how glass could be used in treating cancer, by attempting to make different types of glass and testing which of these could sustain temperatures of 40°C for the longest. The Glass Sellers Company works in collaboration with the Association for Science Education (ASE) to deliver our projects around the country.